For the moon of Jupiter, see Pasithee (moon). For the plant genus, see Pasithea (plant). Not to be confused with Pasiphaë. In Greek mythology, Pasithea (Ancient Greek: Πασιθέα, "relaxation"), or Pasithee, was one of the Charites (Graces), and the personification of relaxation, meditation, hallucinations and all other altered states of consciousness. The Charites are usually said to be the daughters of Zeus and Eurynome, but Pasithea's parentage is given (by the poet Nonnus) as Hera and Dionysus. She was married to Hypnos, the god of sleep. Her sisters are Aglaea ("Splendor"), Euphrosyne ("Mirth"), and Thalia ("Good Cheer"). 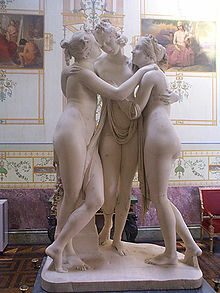 In Roman mythology they were known as the Gratiae, the "Graces". In book 14 of Homer's Iliad, Pasithea was one of the younger Charites. Hera promises her in marriage to Hypnos the god of sleep in exchange for a favor. Robert Graves thinks that Homer also mentions the names of two Charites, Pasithea and Cale ("Beauty"), but the two Charites Homer used for Hesiod's Aglaea. Although the Graces usually numbered three, according to the Spartans, Cleta, not Thalia, was the third, and other Graces are sometimes mentioned including Auxo, Hegemone, Peitho and Phaenna. Pasithea is also the name of one of the Nereids. ^ Nonnus, Dionysiaca, 31.103 ff. ^ Nonnus, Dionysiaca, 15.87 ff. ; 33.4 ff. Look up Pasithea in Wiktionary, the free dictionary. This page was last edited on 3 December 2018, at 18:41 (UTC).